A horrific road accident in the early hours of Wednesday in Kyiv took the life of a 32-year-old car racer and his 20-year-old passenger, according to Oksana Blischik, the spokesperson of Kyiv Police. "The capital's police are establishing the circumstances of a fatal accident in Holosiyivsky district of Kyiv. A traffic accident which killed two took place near Saperno-Slobodska Street," she wrote on Facebook. As Blischik noted, the police have determined at the scene that, according to preliminary information, a speeding Volkswagen skidded to the right, stumbled over the curb and hit the overpass supports. Read alsoBuilding collapses in downtown Kyiv“The vehicle was torn into three parts in the collision. 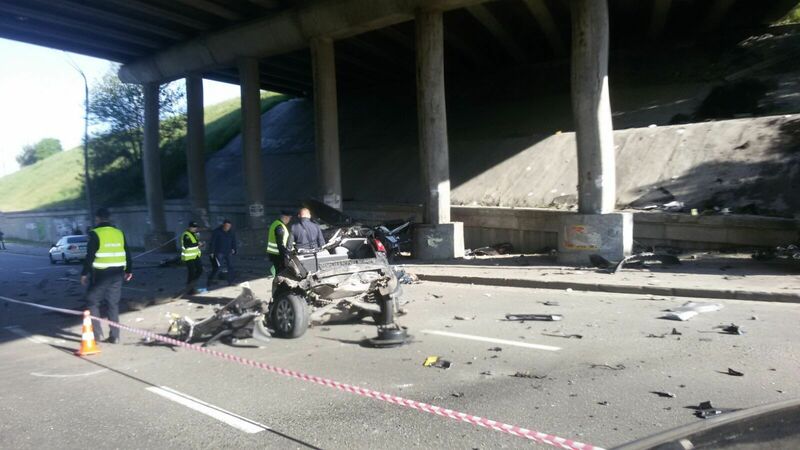 A 32-year-old driver from Kyiv and a 20-year-old passenger, a native of Donetsk region have died at the scene from sustained injuries. It was also established that a driver was a car racer," the press secretary wrote. Read alsoKyiv mayor Vitali Klitschko rides bike to workAccording to dtp.kiev.ua, one of the victims turned out to be a car racer Taras Kolesnik, born in 1984.